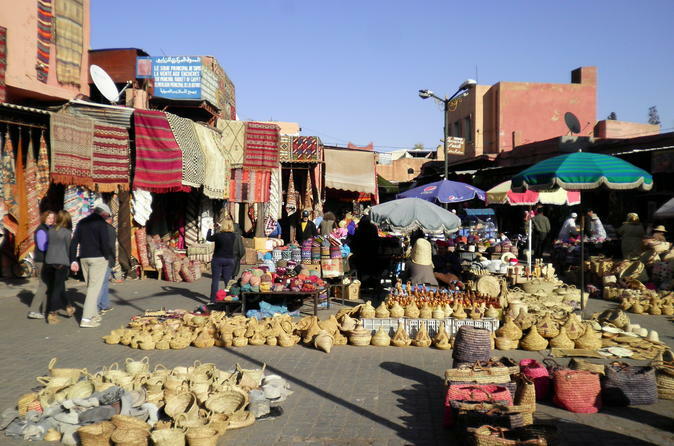 Get under the skin of Marrakech’s ancient medina and historical highlights on this full-day tour, including lunch. With a knowledgeable local guide, stroll through the tangled lanes and souks; take in the sights, sounds and aromas of vast Djemaa El Fna; and explore the ornate pavilions and gardens of the beautiful Bahia Palace and Saadian Tombs. Savor lunch at a medina restaurant and take snaps of top Marrakech attractions such as Koutoubia Mosque. Nach einer Abholung in Ihrem Hotel in Marrakesch oder am zentralen Treffpunkt steigen Sie in Ihr klimatisiertes Fahrzeug und fahren zur Medina in der Altstadt. Folgen Sie Ihrem Führer zu Fuß durch die stimmungsvollen Straßen. Nehmen Sie die geschäftigen Souks in sich auf und lesen Sie die Textilien, Gewürze und andere zum Verkauf angebotene Waren, während Sie Geschichten über die Geschichte der Medina hören. Begeben Sie sich zum zentralen Platz von Djemaa El Fna und bewundern Sie das Schauspiel von Imbissbuden und Straßenkünstlern, darunter Theateraufführungen von Tänzern, Schlangenbeschwörern und Magiern. Besuchen Sie den Bahia-Palast, eine Residenz aus dem späten 19. 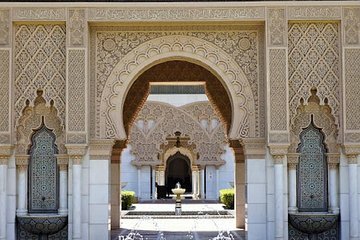 Jahrhundert, die für zwei Sultans von Marokko erbaut wurde und als einer der schönsten Paläste seiner Zeit erbaut wurde. Bewundern Sie die wunderschönen Pavillons und den mit Mosaiken und Springbrunnen geschmückten Innenhof. Anschließend gelangen Sie zu den Saadian-Gräbern, einer Gruppe von kompliziert gekachelten Sultan-Mausoleen, die erstmals 1917 entdeckt wurden. Genießen Sie ein köstliches Mittagessen in einem Medina-Restaurant und besichtigen Sie anschließend einige der historischen Highlights von Marrakesch. Machen Sie Fotos von der Koutoubia-Moschee und dem Ben Youssef Medersa College und sehen Sie unter anderem, warum und wie sie gebaut wurden. Ihre Tour endet mit einer Rückgabe bei Ihrer Unterkunft. Diese Tour hat mir sehr gut gefallen, da unser Reiseführer außerhalb des Programms uns wunderbare Einblicke in Innenhöfe bzw. Riads gegeben hat. Man kann einfach in sehr kurzer Zeit in einem angenehmen Zeitrahmen die schönsten Sehenswürdigkeiten entdecken. Ich würde diese Tour auf jeden Fall weiterempfehlen. We highly enjoyed the tour through Marrakesh! We were picked up from our hotel right on time. Both guides did an excellent job explaining sights, history and culture. Included lunch it worth every penny - great quality and stunning view from the restaurant over the city and the atlas mountains! Only the pharmacy visit could be canceled or offered as an option, while other people get free time to explore something else. We were not interested in buying anything, though other people of the group used the opportunity. Fortunately the only please-buy-sth-event in the whole tour. Super friendly and knowledgeable guide made for not only a perfect day of sightseeing but also an education in the culture and history of the city and its people. Our family of 4 were joined by 4 other visitors so made it almost a personal experience. Had lovely lunch on a roof top terrace overlooking the city which made a nice surprise and restful break. There was plenty of time to explore on our own, take photos and soak up the atmosphere especially at the end of the day overlooking the Jamaa El-Fina Square as it came to life. Always felt safe and never troubled. I should have listened when I read the most recent reviews for this tour; however, as I always had a good experience with tours that I book through Viator, I decided to go for it. The tour guide was very rude. He would bring us (me and 6 other people) to a site and just disappear. He never presented himself to us. I had to ask him for his name mid-tour. He took us to a place to buy argan oil, and come to find out, the oil (which was expensive) was not pure argan oil. I didn't finish the tour and requested to go back to the hotel because it really was not enjoyable. From 9 to 12 three famous sights were visited, then lunch and the souks. Very little, practically no information was given on what we have seen. Recommended for those who want to travel in a van between sights instead of a taxi and want somebody else buying the tickets. We very much enjoyed the city tour and lunch with Ismail, our tour guide. Ismail was very knowledgeable and friendly and spoke excellent English, which was easy to understand! Ismail is very personable and represented Morocco in a very honorable fashion!!! I would not recommend this trip. The guide only took us to shops where he was getting a backhander. Not worried when he lost a lone female group member in the souk. Overall the locations were beautiful however our tour guide was underwhelming. He almost lost 2 people from our tour group, constantly repeated himself, and didn't pause long enough at key photo opportunities and too long in locations that weren't that meaningful. First we were told to meet our guide at a place we couldn't find on google, when we contacted them for directions they said it wasn't on any map and we should ask at our Riad - why arrange to meet somewhere that isn't on any map? Our Riad had no idea where it was either. Fortunately we did manage to change the meeting place but it was stressful at the last minute. The morning was mostly ok going to the places we expected and lunch was at a typical tourist restaurant which was fine. Unfortunately the guide was more interested in 'shopping' and getting commission first a cake shop with 10 Euro cakes - just a quick stop outside so not really a problem but then we were shut in a room while they tried to sell us all spices and oils, then we were taken to a Riad and a random museum which I wasn't expecting and seemed pointless particularly as we were staying in a Riad. We were taken through the souks and told we weren't allowed to buy anything we had to buy at the shop he was taking us to. This got even worse when we were then told we would have to spend half an hour in the shop. I had only booked this tour as I believed it included the Majorelle Gardens as did another couple on the tour this seems to have disappeared from the itinerary listed now and when I realised we wouldn't be going and and would instead be spending half an hour in a shop so the guide could get commission we promptly left and had to get a taxi ourselves to the gardens. The tour was brilliant. The museums and the souks were inspiring. However, the lunch was poor. It's clearly mass produced and 'tagine' sold to gullible tourists. Having said that, the whole day was fantastic and worth the money! I would book this if you go to Morocco!